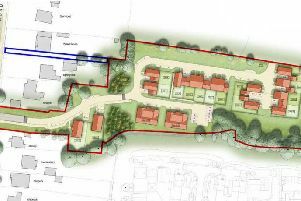 Mid Sussex District Council’s planning department has been accused of showing ‘unjustifiable bias’ towards a man who built a house in the wrong place. In 2017, the council gave permission for the house to be built in the back garden of Chippendale, in Gatehouse Lane, Burgess Hill. Last August, neighbours pointed out that it was being built more than a metre away from where it should have been – but no action was taken. At a meeting of the planning committee on Thursday (March 28) members were asked to approve the change – which the developer insisted had been made in error. Neighbour Claire Pickford was just as insistent that the change had been deliberate. Mrs Pickford told the meeting she had received ‘no satisfactory responses’ as to why the concerns raised in August had been ignored or why enforcement officers had not called for building work to be stopped while the matter was dealt with. She added: “The planning department has shown an unjustifiable bias towards the developer, resulting in the current situation. Her frustrations appeared to be shared by a number of councillors. Phillip Coote (Con, Crawley Down & Turners Hill) said: “I know this is a simplistic way of looking at it, but it isn’t where it was supposed to be. Mr Coote pointed out that in his ward, there had been two similar cases in the past two years ‘and we’ve done nothing about it’. Pru Moore (Con, Burgess Hill – Leylands) said: “Over a metre is actually quite a lot. It’s not an easy mistake to make. Mrs Moore was worried that allowing the ‘error’ to stand would set a precedent for future applications. She said: “If this goes ahead and the next one comes up, we’ve got to ignore that one. Colin Holden (Con, Burgess Hill – St Andrews) said: “The number of times that we’ve sat in this committee and been told we can’t do something because planning law in effect says we can’t do it. Their hands, however, appeared to be tied. Members were told that planning law gave clear guidance stating that action – such as ordering the home to be demolished and rebuilt in the right place – should not be taken just because there had been a technical breach of the permission. Each cased had to be judged on its merits. The application was approved by five votes to four.